Tis’ the season for hot chocolate, apple cider, and winter PJs! This winter will be a cold one, so it’s imperative that you have a good set of warm and comfortable pajamas to bundle up in while you’re sitting by the fire and watching the snow fall. Here are some places where you can get cute PJs that will keep you warm and cozy for this upcoming winter. Victoria’s Secret’s Fireside Long Jane Pajama is perfect for wintry nights and for staying comfortable. You can pick your favorite color or pattern from a variety of options. Nothing screams “winter” more than flannel pajamas with skiing gingerbread on them. This comfy set of PJs comes in many holiday-themed patterns and definitely comes in handy when your goal is to keep warm! Sometimes, we just don’t want to grow up and have to wear adult pajamas, so we turn to what we wore as a child. If you ever wore footie pajamas when you were younger, then you should remember how comfortable they are! Who says you can’t wear them anymore? 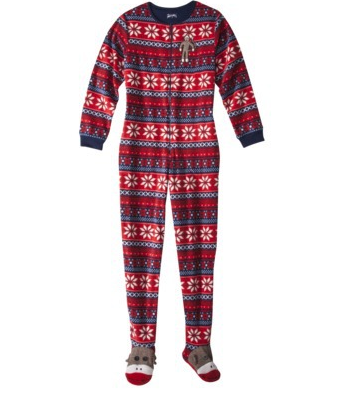 Target has a large collection of different styled footed pajamas for this upcoming winter. Better go get a pair before they’re all sold out!